In this week’s Gotham we see the fight for the power of Gotham coming to a head between Sofia and Jim & co. A lot happens this week that will definitely shift the landscape of Gotham. Let’s check it out! The episode begins with Riddler rescuing Martin from Sofia’s men who are holding him captive. 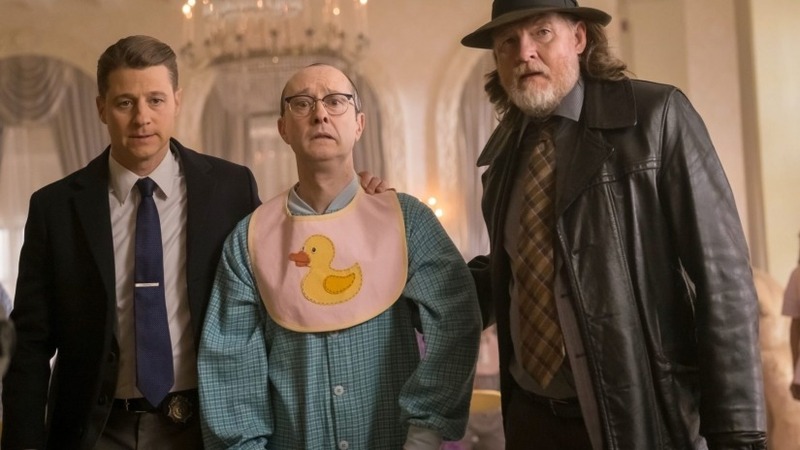 Riddler used Martin’s notepad to give him step by step instructions on what to do, leading to Riddler taking care of the two goons and getting Martin out of there. While this is happening, Lee stops by the narrows to see the way that Samson is terrorizing her people. He is holding public executions to scare the citizens of the narrows into paying for his protection…from Samson's own people. While this is happening, Jim and Harvey are trying to come up with a plan of how to proceed. Jim asks Harvey for what seems like the 100th time to rejoin the force, and this time it finally works. Harvey agrees to help Jim, but makes it clear that after they take down Sofia Jim will have to pay for what he’s done. Harvey uses his old contacts and visits a former hitwoman of Falcone’s to try and get some information that can help him and Jim take down Sofia. He learns that Mr. 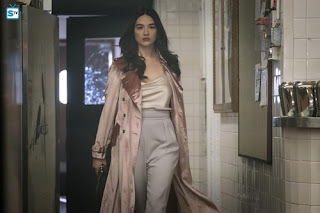 Pent, Falcone’s old bookkeeper that was working for Penguin, was actually double crossing him and working for Sofia all along. Harvey goes to Arkham to ask Penguin about Mr. Pent and hopefully be able to track him down. At the same time, Sofia got word that Martin has escaped and sends Zsasz and Headhunter (who is back without missing a beat) to go kill Penguin. Harvey, Zsasz, and Headhunter are in a standoff that Harvey is surely going to lose. Luckily for him, Riddler helps Penguin escape as this is going on - sounding an alarm that scares Zsasz and Headhunter off. Riddler and Penguin go to Lee’s place where it quickly becomes clear that all of them have the same mission – to take down Sofia. Riddler has the idea to employ Victor Fries’ talents to freeze Penguin and deliver him to Sofia as a Trojan Horse, but this idea is quickly dismissed by Penguin. Lee tells Riddler to go recruit Grundy to help the cause. Riddler doesn’t know that Butch is back and he doesn’t get the warm welcome he was expecting to receive from Grundy. Butch ties Riddler up and delivers him to Barbara and Tabitha. Barbara has been suffering from splitting migraines where she is hearing voices and can barely stand the pain. 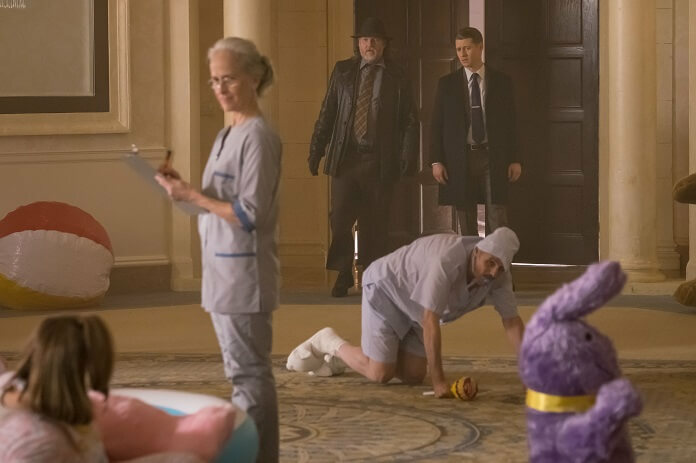 She manages to put that aside to deliver Riddler to Sofia in the hopes that he will give up Penguin leaving Lee with no allies left – essentially ending the rebellion. Penguin becomes anxious that Riddler hasn’t returned and leaves Lee’s apartment, walking right into Jim and Harvey who were out looking for him. Penguin reiterates the fact that he was set up and did not kill Martin and that he will prove it once Sofia is taken care of and Martin will be safe. Jim realizes that he and Penguin also want the same thing, to take down Sofia – although Jim wants to arrest her while Penguin wants her 6 feet under. Jim and Harvey let Penguin know that Mr. Penn is the one who betrayed him and after a little temper tantrum, Penguin tells them they can most likely find Mr. Penn at a spa right outside of Gotham. Zsasz and Headhunter interrupt this reunion and a fire fight ensues. As the firefight is happening, Lee manages to rescue Penguin and drives him away from the danger. With Penguin gone, Zsasz and Headhunter lose interest in the situation at hand and retreat. Lee and Penguin decide to go through with Riddler’s earlier Trojan Horse plan and go to visit Victor Fries. Fries gives Penguin a heating device that is set on a timer so he will be able to get out of the ice and ambush Sofia, killing her. While this is happening, Riddler has been delivered to Sofia and she is having him tortured to try and find out where Penguin is. Riddler does not give up Penguin’s location and before the torturing can continue, it is interrupted by Fries delivering the frozen Penguin to Sofia. Riddler immediately laughs to himself knowing that this is his Trojan Horse plan coming to fruition. Sofia has no need for Riddler anymore so she orders a couple of her men to take him to the docks and kill him. Zsasz and Headhunter get to the mansion and tell Sofia that they overheard Jim and Harvey saying they were looking for Mr. Penn. Sofia and her men immediately go to get to Mr. Penn before Jim and Harvey can. Jim and Harvey arrive at the resort and spa where Mr. Penn is, and needless to say… it is quite interesting. Penn tells the two of them everything and just as they are about to leave, Sofia and her men show up and Jim gets shot in the side. Jim tells Harvey to get Mr. Penn to safety while he distracts Sofia and her men. Zsasz and Headhunter go after Harvey while Sofia and the rest of the men go after Jim. Lee pulls up in front of the resort and lets Harvey take the car to get Mr. Penn out of there while she goes to look for Jim and Sofia. Jim manages to take out a bunch of Sofia’s men, but Sofia shoots him multiple times. As Jim is laying on the ground, Sofia approaches him at gunpoint and tells him to beg for his life and ask for forgiveness so the two of them can start over. Jim isn’t the biggest fan of that plan and tells Sofia to go to hell. Right before Sofia is about to shoot Jim, she gets shot from behind. She turns to see that it was Lee who shot her and Lee puts another bullet right between Sofia’s eyes. As this is happening, Penguin’s heating device turns on and he breaks out of the ice. He finds out that Riddler has been taken to the docks to get killed and he forgoes his opportunity to take down Sofia to go save his friend. He gets there right in the nick of time and they share a great bromance moment. Jim awakens in the hospital to see Harvey next to his bed waiting for him. Harvey lets Jim know that Lee kept him alive until the medics were able to get to him. Harvey also tells Jim the unfortunate news that somehow Sofia is not dead, she is in a coma. Jim tells Harvey that it is time for him to come clean about the Pyg and what Jim knew, but Harvey shoots down that idea. He tells Jim that that would be selfish of him to do – it would clear his conscience, but would rid the city of the hero they need Jim to be. There was a ton to process in this week’s episode. The episode featured some great comedic moments like the Riddler rescuing Martin and then taking him out to ice cream and then some dark ones like Lee taking out her anger and frustration on Samson’s hand. When the dust settled, it looks like Sofia has been neutralized for now. It is shocking that she managed to survive getting shot in the head by Lee. There is a reason that they kept her alive and she will definitely return in some form or another – in what way and when that will be, I have no idea, but it will happen. It also seems like the story line of Jim confessing about his knowledge in the Pyg debacle is being put to rest as well. I’m glad to see that over with – it was played out enough by now and we were all ready to move on from it. I’m curious to see how this angry and dark version of Lee progresses with running the narrows and how she will interact with Jim from here on out. Bruce hears rustling around in the kitchen and thinks someone may have broken in. Turns out it was just Selina searching for food. Selina asks Bruce for help, which of course just means she needs him to bankroll something for her. Selina feels guilty about the jewelry she stole from the Wayne Enterprises scientist that Ivy ended up killing. She wants to repurchase the items from the person she sold them too, but she knows it going to be expensive. Bruce agrees to help her and they pay his shop a visit. As is typical with Selina there is a part of the story that she didn’t fill Bruce in on. She had tried to rob the shop the night before to get the jewelry back and the shop owner is not too pleased about it. He decides that the appropriate course of action would be to keep the jewelry and rob Bruce and Selina. Bruce and Selina fight side by side and quickly dispatch of him and his men. As they’re leaving with the jewelry, Bruce throws the money on top of the guy. 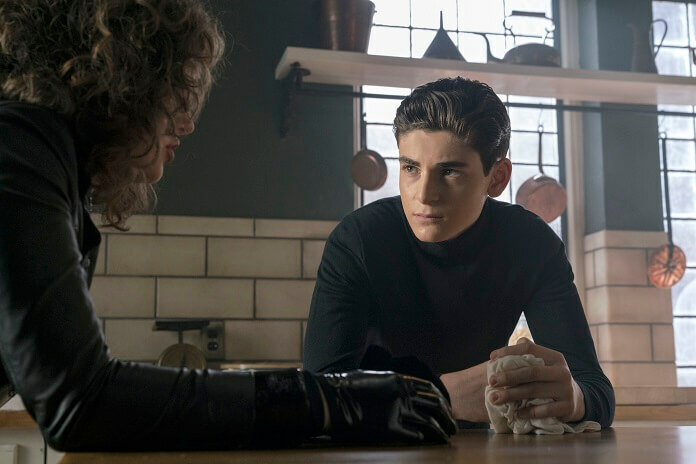 Selina asks Bruce another favor – to return the jewelry to the family she stole it from. Bruce tells her that she can summon the courage to do it herself. Bruce fighting alongside Selina is something I think we will see a lot of in the future. Selina shows again that while she may be a thief, she does have a conscience. I very much enjoy the interactions between these two and the offbeat relationship they have and I am glad we are continuing to be able to see it progress in the show. Gotham is doing justice to the interesting relationship that Batman and Catwoman have always had. It’s looking like Jerome escapes from Arkham and is back on the streets of Gotham. We see a quick snapshot of Tetch and Scarecrow as well – could this be part of Joker’s plan that he mentioned to Penguin last week? There is a showdown with Selina and Bruce against Jerome where Selina has him held at gunpoint. And of course Barbara’s shiny hand story continues… I am very curious to see where that is taking us.